The site of the moated manor-house of Penhallam at Bury Court, excavated by Beresford, 1968-73. The site of the moated manor-house of Penhallam, at Bury Court. Excavation by Beresford in advance of aforestation between 1968 and 1973 revealed the remains of a sophisticated 13th century manor house with associated buildings and a chapel, arranged around a courtyard and surrounded by a moat. It was suggested that the site originated as an early Norman ringwork. Fragmentation of the manorial lands led to desertion of the house by the 14th century. Its successor is a small farmstead, outside the moat, called Bury Court. 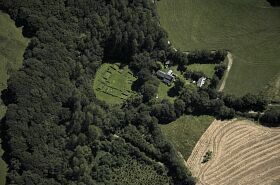 The foundations of the manor house and moat are visible on aerial photographs (p1) and were plotted during the Cornwall NMP. <1> Thorn, C & F (Eds), 1979, Domesday Book 10: Cornwall, 5, 3, 19 (Bibliographic reference). SCO4703. <p1> CAU, 1989, F20/76 + 83 (Photographic Record). SCO17873. <2> Henderson, C, 1914, Notebooks of Parochial Antiquities (Unpublished document). SCO3503. <p2> CAU, 1989, F26/39-41 + 43 (Photographic Record). SCO17998. <3> Henderson, C, 1925, The Cornish Church Guide, 113 (Bibliographic reference). SCO3512. <4> Beresford, G, 1970, Unknown Title, VOL 14, 189-190 (Article in serial). SCO5082. <5> Beresford, G, 1971, Berry Court, Jacobstow (Cornish Archaeology No 10, 1971) (Article in serial). SCO224. 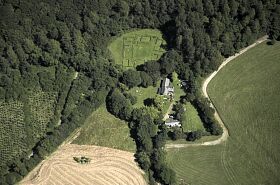 <6> Beresford, G, 1974, The Medieval Manor at Penhallam, Jacobstow, Cornwall (Article in serial). SCO2821. [p1] SCO17873 - Photographic Record: CAU. 1989. F20/76 + 83. ABP. SCO4703 - Bibliographic reference: Thorn, C & F (Eds). 1979. Domesday Book 10: Cornwall. 5, 3, 19. [p2] SCO17998 - Photographic Record: CAU. 1989. F26/39-41 + 43. ABP. SCO3503 - Unpublished document: Henderson, C. 1914. Notebooks of Parochial Antiquities. MS At RIC. SCO3512 - Bibliographic reference: Henderson, C. 1925. The Cornish Church Guide. 113. SCO5082 - Article in serial: Beresford, G. 1970. Unknown Title. Medieval Archaeology Vol 14. VOL 14, 189-190. SCO224 - Article in serial: Beresford, G. 1971. Berry Court, Jacobstow (Cornish Archaeology No 10, 1971). SCO2821 - Article in serial: Beresford, G. 1974. The Medieval Manor at Penhallam, Jacobstow, Cornwall. Medieval Archaeology Vol 18.